Since Ben's birthday is in August, I've come to realize that he'll likely not be in school to be able to celebrate with his class. He has pointed it out too, so I emailed his teacher last week and asked if he could bring cupcakes in before the end of the year. She said yes and Ben decided he wanted to do cheeseburger cupcakes. 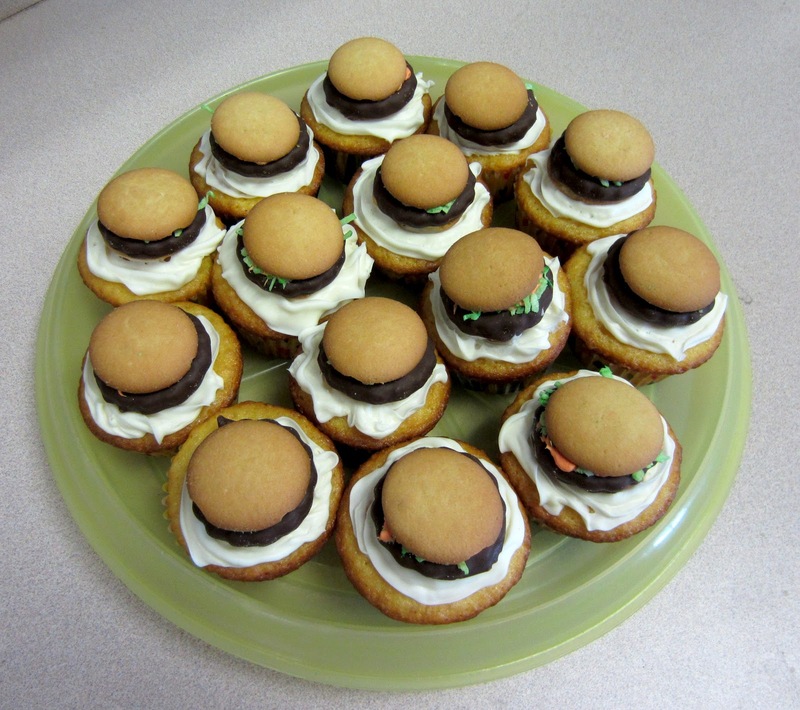 They are pretty simple, just a vanilla cupcake with a piped white icing, but on top, we made his favorite cheeseburger cookies for decoration. 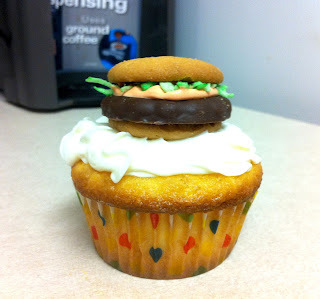 I've blogged those before, but just take two Nilla wafers, a Keebler Grasshopper cookie, coconut dyed green, and vanilla icing dyed orange and assemble to look like a cheeseburger. These were quite the hit with the first graders, and his little friend Marissa gave me a note afterwards that said "I like your cooking!" Love the burger cupcakes! I am visiting from Thee Blog Hop. Better late than never right? I am a new follower. Hope you will stop by http://www.garagesalesrus.blogspot.com/ and do the same.